Before getting into the drama, Andy shared a clip of exes Kelly Dodd and Michael Dodd’s electric chemistry. He asked the obvious question: Do you think Kelly and Michael will get back together? Emily admitted, “I don’t know. I would have said no, but when I watched that scene, I was like ‘there’s a little sexual tension there. '” She added, “They were cute.” They really were! Why didn’t someone from Bravo step in to clear this up? 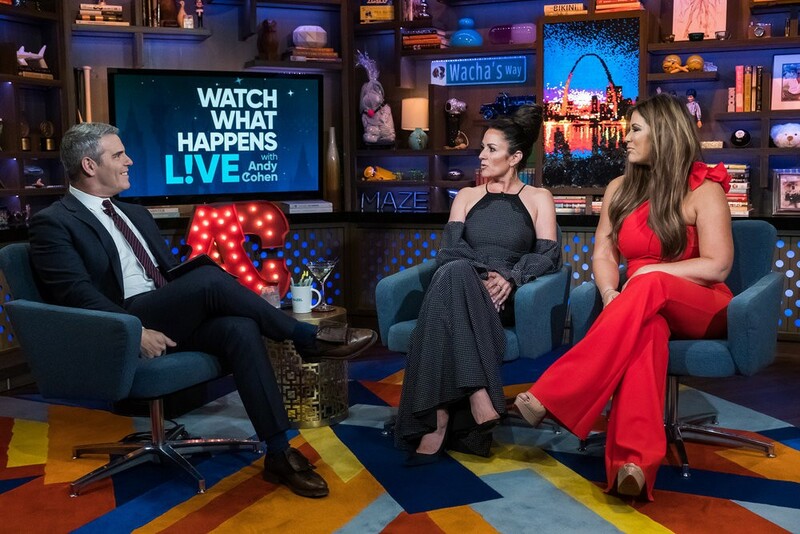 Watch What Happens Live is a show on the Bravo network. This seems like an easy mystery to solve. Andy confessed, “First of all, I’m so uncomfortable with this entire fight, as you know. The three of us, I feel like we all came up together on Bravo.” He admitted, “I never enjoy a fight, but this one I hate. Really, it’s very upsetting to me.” I feel the same way, Andy. Well, minus the part about having a longrunning Bravo show. Maybe we can change that? I would love to relate. Well, yeah. Of course Tamra, Shannon, and Vicki are going to ban together against fresh blood in the cast. That’s pretty much a given. Check out the photos of Andy, Emily, and Jenni from last night’s episode by clicking through the gallery below. TELL US- ARE YOU SURPRISED THAT ANDY COHEN IS SO EMOTIONALLY INVESTED IN JENNI & JEFF’S FALLING OUT? DOES EMILY OWE SHANNON AN APOLOGY?